“Will you give me your youngest daughter? If you will, I’ll make you as rich as you are now poor,” said the Bear. Well, the man would not be at all sorry to be so rich; but still he thought he must have a bit of a talk with his daughter first; so he went in and told them how there was a great White Bear waiting outside, who had given his word to make them so rich if he could only have the youngest daughter. The lassie said “No!” outright. Nothing could get her to say anything else; so the man went out and settled it with the White Bear that he should come again the next Thursday evening and get an answer. Meantime he talked his daughter over, and kept on telling her of all the riches they would get, and how well off she would be herself; and so at last she thought better of it, and washed and mended her rags, made herself as smart as she could, and was ready to start. I can’t say her packing gave her much trouble. 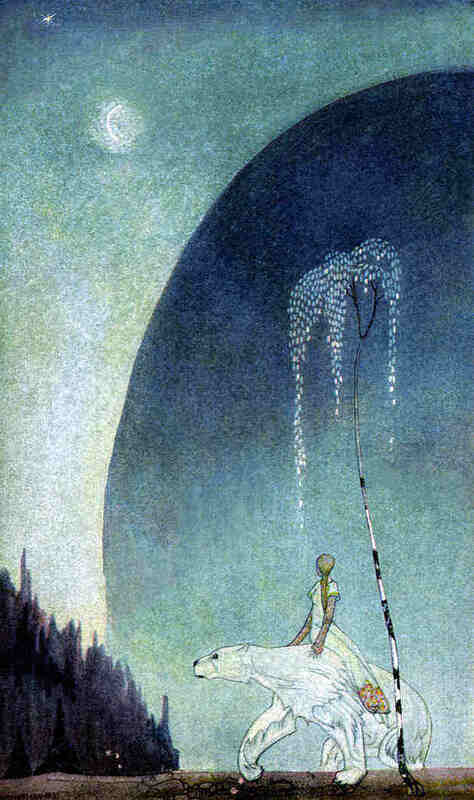 “Next Thursday evening came the White Bear to fetch her, and she got upon his back with her bundle, and off they went.” Illustration by Kay Nielsen. Published in East of the Sun and West of the Moon: Old Tales from the North byAsbjørnsen & Moe (1926? ), George H. Doran Company. “Well! mind and hold tight by my shaggy coat, and then there’s nothing to fear,” said the Bear. So she rode a long, long way, till they came to a great steep hill. There, on the face of it, the White Bear gave a knock, and a door opened, and they came into a castle where there were many rooms all lit up; rooms gleaming with silver and gold; and there, too, was a table ready laid, and it was all as grand as grand could be. Then the White Bear gave her a silver bell; and when she wanted anything, she was only to ring it, and she would get it at once. Well, after she had eaten and drunk, and evening wore on, she got sleepy after her journey, and thought she would like to go to bed, so she rang the bell; and she had scarce taken hold of it before she came into a chamber where there was a bed made, as fair and white as any one would wish to sleep in, with silken pillows and curtains and gold fringe. All that was in the room was gold or silver; but when she had gone to bed and put out the light, a man came and laid himself alongside her. That was the White Bear, who threw off his beast shape at night; but she never saw him, for he always came after she had put out the light, and before the day dawned he was up and off again. So things went on happily for a while, but at last she began to get silent and sorrowful; for there she went about all day alone, and she longed to go home to see her father and mother and brothers and sisters. So one day, when the White Bear asked what it was that she lacked, she said it was so dull and lonely there, and how she longed to go home to see her father and mother and brothers and sisters, and that was why she was so sad and sorrowful, because she couldn’t get to them. So one Sunday the White Bear came and said, now they could set off to see her father and mother. Well, off they started, she sitting on his back; and they went far and long. At last they came to a grand house, and there her brothers and sisters were running about out of doors at play, and everything was so pretty, ’twas a joy to see. “No! bless her, she’d not forget;”—and when she had reached the house, the White Bear turned right about and left her. Then, when she went in to see her father and mother, there was such joy, there was no end to it. None of them thought they could thank her enough for all she had done for them. Now, they had everything they wished, as good as good could be, and they all wanted to know how she got on where she lived. Well, she said, it was very good to live where she did; she had all she wished. What she said beside I don’t know, but I don’t think any of them had the right end of the stick, or that they got much out of her. But so, in the afternoon, after they had done dinner, all happened as the White Bear had said. Her mother wanted to talk with her alone in her bedroom; but she minded what the White Bear had said, and wouldn’t go upstairs. “Oh! what we have to talk about will keep!” she said, and put her mother off. But, somehow or other, her mother got round her at last, and she had to tell her the whole story. So she said, how every night when she had gone to bed a man came and lay down beside her as soon as she had put out the light; and how she never saw him, because he was always up and away before the morning dawned; and how she went about woeful and sorrowing, for she thought she should so like to see him; and how all day long she walked about there alone; and how dull and dreary and lonesome it was. Yes! she took the candle and hid it in her bosom, and as night drew on, the White Bear came and fetched her away. But when they had gone a bit of the way, the White Bear asked if all hadn’t happened as he had said. So when she reached home, and had gone to bed, it was the old story over again. There came a man and lay down beside her; but at dead of night, when she heard he slept, she got up and struck a light, lit the candle, and let the light shine on him, and so she saw that he was the loveliest Prince one ever set eyes on, and she fell so deep in love with him on the spot, that she thought she couldn’t live if she didn’t give him a kiss there and then. And so she did; but as she kissed him, she dropped three hot drops of tallow on his shirt, and he woke up. Then she asked if she mightn’t go with him. So when she had rubbed the sleep out of her eyes, and wept till she was tired, she set out on her way, and walked many, many days, till she came to a lofty crag. Under it sat an old hag, and played with a gold apple which she tossed about. Here the lassie asked if she knew the way to the Prince, who lived with his step-mother in the Castle, that lay East of the Sun and West of the Moon, and who was to marry the Princess with a nose three ells long. So she got upon the horse, and rode a long, long time, till she came to another crag, under which sat another old hag, with a gold carding-comb. Here the lassie asked if she knew the way to the castle that lay East of the Sun and West of the Moon, and she answered, like the first old hag, that she knew nothing about it, except it was east of the sun and west of the moon. And this old hag gave her the golden carding-comb; it might be she’d find some use for it, she said. So the lassie got up on the horse, and rode a far, far way, and a weary time; and so at last she came to another great crag, under which sat another old hag, spinning with a golden spinning-wheel. Her, too, she asked if she knew the way to the Prince, and where the castle was that lay East of the Sun and West of the Moon. So it was the same thing over again. “Maybe it’s you who ought to have had the Prince?” said the old hag. But she, too, didn’t know the way a bit better than the other two. “East of the sun and west of the moon it was,” she knew—that was all. And so, too, she gave her the gold spinning-wheel. “Maybe you’ll find a use for it,” said the old hag. Then on she rode many many days, a weary time, before she got to the East Wind’s house, but at last she did reach it, and then she asked the East Wind if he could tell her the way to the Prince who dwelt east of the sun and west of the moon. Yes, the East Wind had often heard tell of it, the Prince and the castle, but he couldn’t tell the way, for he had never blown so far. So when they got there, they went into the West Wind’s house, and the East Wind said the lassie he had brought was the one who ought to have had the Prince who lived in the castle East of the Sun and West of the Moon; and so she had set out to seek him, and how he had come with her, and would be glad to know if the West Wind knew how to get to the castle. Yes! she got on his back, and so they travelled to the South Wind, and weren’t so very long on the way, I should think. When they got there, the West Wind asked him if he could tell her the way to the castle that lay East of the Sun and West of the Moon, for it was she who ought to have had the Prince who lived there. “You don’t say so! That’s she, is it?” said the South Wind. Yes! she got on his back, and away he went from his house at a fine rate. And this time, too, she wasn’t long on her way. So when they got to the North Wind’s house, he was so wild and cross, cold puffs came from him a long way off. “Blast you both, what do you want?” he roared out to them ever so far off, so that it struck them with an icy shiver. Yes! with all her heart; she must and would get thither if it were possible in any way; and as for fear, however madly he went, she wouldn’t be at all afraid. Early next morning the North Wind woke her, and puffed himself up, and blew himself out, and made himself so stout and big, ’twas gruesome to look at him; and so off they went high up through the air, as if they would never stop till they got to the world’s end. So they tore on and on—no one can believe how far they went—and all the while they still went over the sea, and the North Wind got more and more weary, and so out of breath he could scarce bring out a puff, and his wings drooped and drooped, till at last he sunk so low that the crests of the waves dashed over his heels. “Are you afraid?” said the North Wind. But they weren’t very far from land; and the North Wind had still so much strength left in him that he managed to throw her up on the shore under the windows of the castle which lay East of the Sun and West of the Moon; but then he was so weak and worn out, he had to stay there and rest many days before he could get home again. “What do you want for your gold apple, you lassie?” said the Long-nose, and threw up the window. “It’s not for sale, for gold or money,” said the lassie. “If it’s not for sale for gold or money, what is it that you will sell it for? You may name your own price,” said the Princess. “Well! if I may get to the Prince, who lives here, and be with him to-night, you shall have it,” said the lassie whom the North Wind had brought. Yes! she might; that could be done. So the Princess got the gold apple; but when the lassie came up to the Prince’s bed-room at night he was fast asleep; she called him and shook him, and between whiles she wept sore; but all she could do she couldn’t wake him up. Next morning, as soon as day broke, came the Princess with the long nose, and drove her out again. So in the daytime she sat down under the castle windows and began to card with her carding-comb, and the same thing happened. The Princess asked what she wanted for it; and she said it wasn’t for sale for gold or money, but if she might get leave to go up to the Prince and be with him that night, the Princess should have it. But when she went up she found him fast asleep again, and all she called, and all she shook, and wept, and prayed, she couldn’t get life into him; and as soon as the first gray peep of day came, then came the Princess with the long nose, and chased her out again. So, in the daytime, the lassie sat down outside under the castle window, and began to spin with her golden spinning-wheel, and that, too, the Princess with the long nose wanted to have. So she threw up the window and asked what she wanted for it. The lassie said, as she had said twice before, it wasn’t for sale for gold or money; but if she might go up to the Prince who was there, and be with him alone that night, she might have it. That evening, when the Princess came with her sleepy drink, the Prince made as if he drank, but threw it over his shoulder, for he could guess it was a sleepy drink. So, when the lassie came in, she found the Prince wide awake; and then she told him the whole story how she had come thither. “Yes!” said the step-mother, with all her heart. Well, that was no great thing they said, so they agreed, and she with the long-nose began to wash away as hard as she could, but the more she rubbed and scrubbed, the bigger the spots grew. But she hadn’t long taken the shirt in hand before it got far worse than ever, and with all her rubbing, and wringing, and scrubbing, the spots grew bigger and blacker, and the darker and uglier was the shirt. “Ah!” said the Prince, “you’re none of you worth a straw; you can’t wash. Why there, outside, sits a beggar lassie, I’ll be bound she knows how to wash better than the whole lot of you. Come in, Lassie!” he shouted. “Can you wash this shirt clean, lassie you?” said he. “Yes; you are the lassie for me,” said the Prince. At that the old hag flew into such a rage, she burst on the spot, and the Princess with the long nose after her, and the whole pack of Trolls after her—at least I’ve never heard a word about them since. As for the Prince and Princess, they set free all the poor Christian folk who had been carried off and shut up there; and they took with them all the silver and gold, and flitted away as far as they could from the Castle that lay East of the Sun and West of the Moon.